CGPSC Recruitment: Chhattisgarh Public Service Commission(CGPSC) has issued an official notification inviting applications for recruitment on Assistant Professor- 2019 (Higher Education). A total of 1384 vacant posts will be filled through the recruitment process. So, this examination provides a gateway through which one can be eligible for the post of Assistant Professor. Interested candidates can apply for CGPSC Assistant Professor Recruitment 2019. The application form releases in the month of February 2019. Applicants who are eagerly waiting for can check latest Chattisgarh PSC Assistant Professor Recruitment 2019 on our website. CGPSC publishes a notification for Assistant Professor Vacancies. So, it is a good chance for applicants who are waiting for Chattisgarh PSC Asst Professor Recruitment 2019 can check details on our page. For the sake of applicants, we enclose the CG Assistant Professor Recruitment Notification in below sections. Therefore, applicants can go through CG PSC Assistant Professor Recruitment Notification 2019 and apply before the Closing Date. For the sake of applicants, we provide CG PSC Assistant Professor Exam 2019 Notification in below sections. Hence, CG PSC is inviting online before the closing date for Assistant Professor. CG PSC issues an employment notification for the CGPSC Assistant Professor 2019. 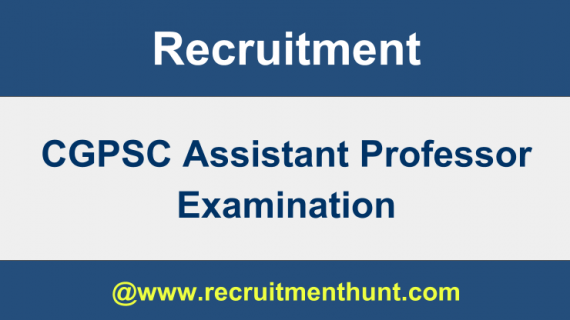 CGPSC Assistant Professor Recruitment 2019 Notification will release for positions of Associate Professor. Hence, to guide them, we, therefore, provide the Syllabus of CGPSC Assistant Professor Exam along with the CGPSC Assistant Professor Exam Pattern. Above all, proper preparation plan is likewise necessary to clear the CGPSC Asst Professor Exam. Therefore, by downloading the CGPSC Asst Professor Syllabus and CGPSC Asst Professor Exam Pattern 2019. Candidates who have completed Post Graduate Degree with 55% Marks from a Reputed Institute are eligible. Candidates who are also NET Qualified followed by UGC, CSIR or by UGC equivalent exam such as SLET/ SET qualified. Candidates age should be Minimum 21 years to Maximum 30 years as on 01.01.2019. 35 years for candidates of Chhattisgarh state. Candidates will be shortlisted on the basis of their performances in the written test to be followed by an interview. After completing the selection rounds, the officials announce the final merit list. The pay scale ranges from Rs.15,600/- to Rs.39,100/- and G.P of Rs.6,000/- (Rs.7,700/- Academic Level-10) per month. Step 2 – Search for CGPSC Assistant Professor Notification link in Careers/ Advertisements/ News page. Step 3 – Check and verify your eligibility to CGPSC Recruitment 2019. Step 4 – For Apply Click online application link “Apply Now”. Step 5 – Click on “Click here for New Registration”, if you are a new user. Step 6 – Complete the Registration & Click on “Submit”. Step 7 – After Registration, Log in with Registered Number & Password. Step 8 – Fill the required Details and Upload required Documents and Pay Application Fee. Step 9 – Check and confirm your details before hitting the Submit button. Step 10 – Once all details confirmed, Submit and Take the printout of your Application. Finally, Candidates can check CG PSC Assistant Professor Recruitment Notifications here. So, Applicants can make their preparation easier by following CG PSC Assistant Professor Exam Pattern. Download CG PSC Assistant Professor Syllabus & Exam Patterns along with CG PSC Assistant Professor Previous Year Question Papers 2019 on this article. Also, For more Job Updates stay Tuned to our site Recruitment Hunt.